In the past, being an ambitious hand or musician meant coming up with new and exciting concepts for albums. With Biophilia, Bjork has decided to reinvent the concept of the album itself. Her seventh longplayer, available both in classic album format as well as in a bundle of specially designed applications, is an interactive nature- and science- themed extravaganza of grand technological proportions. Hans Ulrich Ohrist caught up with Bjork to find out how the touchscreen has permanently altered the way the Icelandic singer creates and hears music. 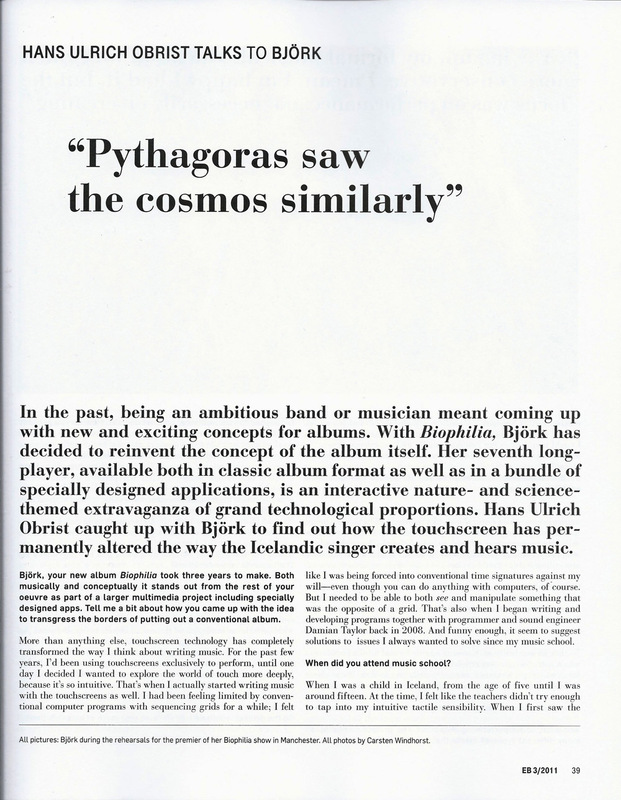 Bjork, your new album Biophilia took three years to make. Both musically and conceptually it stands out from the rest of your oeuvre as part of a larger multimedia project including specially designed apps. Tell me a bit about how you came up with the idea to transgress the borders of putting out a conventional album. More than anything else, touchscreen technology has completely transformed the way I think about writing music. For the past few years, I’d been using touchscreens exclusively to perform, until one day I decided I wanted to explore the world of touch more deeply, because it’s so intuitive. That’s when I actually started writing music with the touchscreens as well. I had been feeling limited by conventional computer programs with sequencing grids for a while ; I felt like I was being forced into conventional time signatures against my will-even though you can do anything with computers, of course. But I needed to be able to both see and manipulate something that was the opposite of a grid. That’s also when I began writing and developing programs together with programmer and sound engineer Damian Taylor back in 2008. And funny enough, it seem to suggest solutions to issues I always wanted to solve since my music school. When did you attend music school ? When I was a child in Iceland, from the age of five until I was around fifteen. At the time, I felt like the teachers didn’t try enough to tap into my intuitive tactile sensibility. When I first saw the touchscreen, it brought me back to my childhood and my experiences with own music. I was so excited to reenter a place where I could map things out compositionally as I experience them, while at the same time drawing a connection to nature. So the touchscreen also inspired you to explore biological and cosmological themes ? Yes, strangely enough. The applications we designed connect a musical element to a natural one, like the shape of lightning being similar to an arpeggio, or double pendulums inspiring the relationship between counterpoint and melody. I was thinking about how somebody without a background in music would want to create music, how a child would explore the basic element of composition. Last time I was in Iceland I met up with the composer Magnús Blöndal Jóhannsson, who passed away not too long ago. He was a real pioneer for electronic music-much adored by people like Karlheinz Stockhausen. Was he at all a role model for you in terms of experimentation ? No, but he was brilliant. Growing up, my formal musical education was much more conservative. I mean. I’m happy I had it, but the focus was on performance, not necessarily on creating. It was about picking an instrument, practicing for ten hours a day. And then maybe in fifteen years, if you’re lucky, becoming part of a symphony orchestra. It certainly wasn’t empowering in the creative sense. 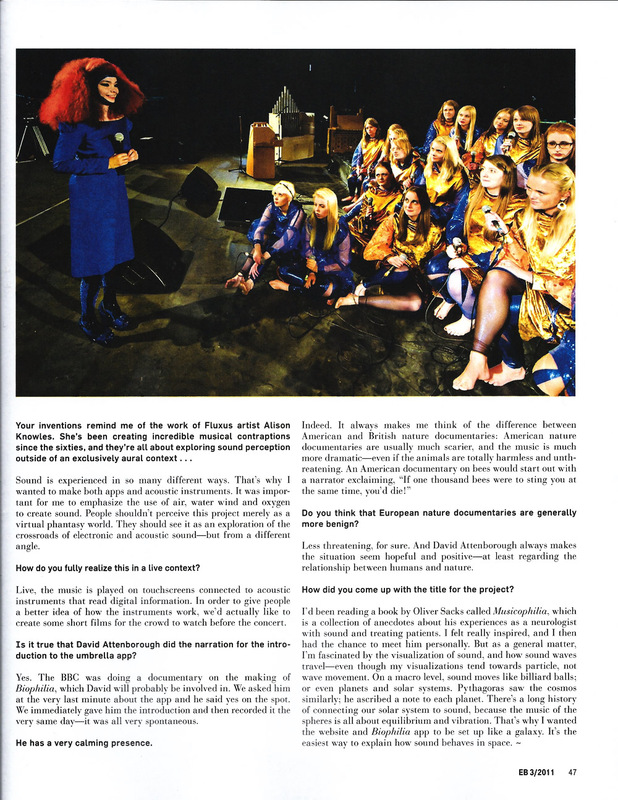 And what about performing Biophilia ? The project combines so far beyond the conventional concert context. How do you present that in all of its complexity ? A normal concert venue will work, but to show everything we’ve done, a museum might be better. We’ve actually gotten offers from a bunch of different museums after our premier in Manchester. There we did a small, stage-bound version of something that’s actually much bigger and more encompassing, spatially speaking. Since then, we’ve gotten offers from the American Museum of Natural History in New York, the Exploratorium in San Francisco, The National Museum of Nature and Science in Tokyo ... which would all be great fits, I imagine. Nothing’s been confirmed yet, but the idea is to use the nature-related apps and instruments we’ve developed as educational tools for children, and then develop exhibits together with biologists, physicists and astronomers. I’m fascinated by the idea of providing the kids with both the technology and the actual objects being discussed. As you know, the umbrella app for Biophilia contains individual apps for each song. I keep imagining the children getting to hold and play with real crystals, and then working with the app from "Crystalline". The Exploratorium in San Francisco actually talked about developing a ten-room exhibit- one room for each song. San Francisco has one of the largest collections of natural crystals in the world. So the project would be transformed into more of an exhibition ? Yes, in collaboration with scientists. The transformation that you describe from one form of presentation to another seems so natural ; it’s an almost organic evolution ; an organic integrated learning system. Biophilia seems to be less about exact replication and more about changing and adapting to a host environment. Very much so. I remember about a year into the project I had to stop myself from trying to control the direction the whole thing was taking and just let it start growing naturally. That’s when the best ideas started to take form. Of course, when we met all of the app developers and designers, the project took an entirely different spin. Six years ago, you and I had a discussion about how to introduce your work into a museum context. The plans were approaching an advanced phase, but had to be put on hold because you were coming out with your album Medulla. Now things seem to be moving again in that direction. What’s changed ? When we met up, I had been really excited about the museum idea,but I think wasn’t really ready for it ; I hadn’t thought enough about how to present things in the museum context. But I would say our conversations from back then planted the seed for what I’m doing today-certainly in terms of how to "show" music and how to make it interactive. This is the first album I’ve done that really allows the listeners to actively immerse themselves in it. The touchscreen and the applications encourage a threefold interaction : between myself and nature, between the listener and the music, and between the listener and nature. The algorithms for the Biophilia apps allow you to not only to alter and rearrange the songs superficially, but also to completely mess with the song structure . . . while still maintaining the connection to the natural elements the songs deal with. The connection to nature, biology and the cosmos is a constant. I remember from our conversations about interactive music that you were interested in doing an exhibition together with the French director Michel Gondry. He was supposed to do the projections for an installation with singers who line a long, dark corridor, I think. That’s right-it was going to be a labyrinth lined with singers performing songs from Medulla. The idea came about because, compositionally, the songs and melodies off the album are so interwoven. I was imagining the exhibition-goers wandering around and singing as well. I think that if I had conceived Medulla as interactive from the very beginning, then it would have been easier to follow through with the exhibition. I’m convinced Biophilia has become what it is because the entire project is predicated on being interactive. After the live premier of Biophilia in Manchester, half the people I spoke to thought they had seen a concert and the other half thought they had seen something else. I would say that whatever it was, it was a compromise. We maxed out our budget a long time ago and didn’t have the funding to do all the stuff we had originally planned. I wanted the event to be really intimate and have people be more involved, and that’s why we set up the stage in the middle of the venue. Children who came by to test the applications when we had days off of performing were actually using the same touchscreens we were-the ones connected to the instruments. I suppose that made the actual performance area something other than a conventional stage. Did you imagine Lots of movement and mobility in the interaction with the audience ? Was the performance supposed to take place throughout the entire venue ? No, more via the touchscreens. This is actually the first time in my life that I wrote songs sitting down, as opposed to being in motion. It used to always happen while I was walking, with the exception of Sugarcubes songs, which were more collaborative. I only realized recently how uncommon it is to not write songs or melodies with a guitar or piano. In the past, I always relied on the sounds of nature as a form of musical accompaniment for my singing. That’s why combining the songs with elements of nature felt totally natural. It wasn’t a utopian vision or some bizarre experimentation ; it was perfectly normal for me to work with these sounds. And live, the touchscreen has allowed me to be able to focus completely on my singing, because the rest of the sounds I’m making are purely intuitive movements and gestures. It’s freed things up for me enormously. Don’t forget the animation. This was definitely a collaborative effort, but I would say most of the collaboration was for the visuals and programming. The music I did almost entirely by myself. I think the older I get, the more idiosyncratic I become in the studio and end up wanting to do the music on my own. I don’t know why, that’s just the way it is. You’re still continuing to work with programmers, right ? You mean app builders ? Of course. But this entire project was interspersed with some pretty big breaks, because I was so intensely involved with environmental issues in Iceland. 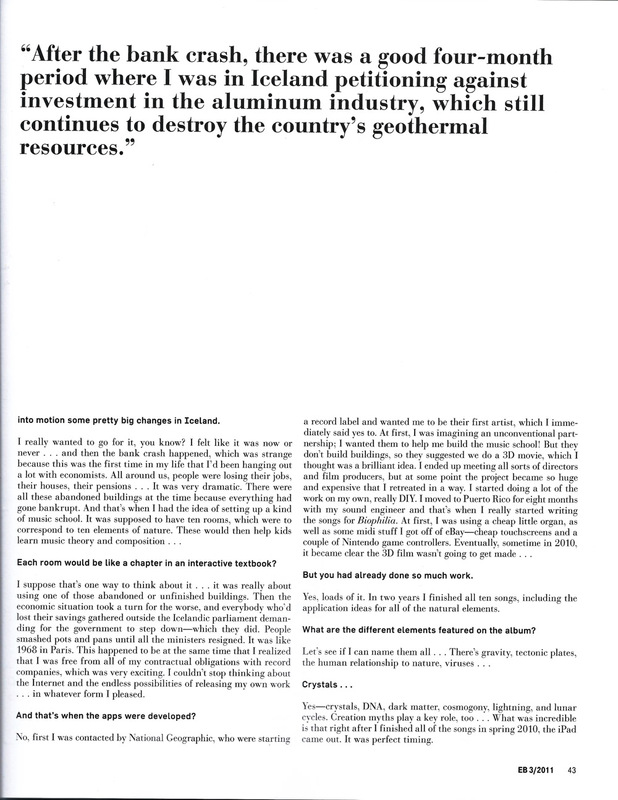 Also, shortly before the bank crash, there was a good four-month period where I was over there petitioning against investment in the aluminium industry which still continues to destroy the Iceland’s geothermal resources, by the way. I was working together with a group called Náttura on developing job alternatives in rural areas where the aluminium smelting plants would otherwise employ entire towns. We encouraged the people to start small businesses to promote a green economy. We also wrote a manifesto, which I gave to the Prime Minister. I’d Love to read that. Where can I get a copy ? It’s online, but it’s in Icelandic. The whole thing is really functional and straightforward. We wanted to avoid doing anything utopian or unrealistic, because people were already calling us idealists and accusing us of being clueless hippies. Were you promoting a micro-credit system, Like in India ? I remember all the international press coverage and how you set into motion some pretty big changes in Iceland. I really wanted to go for it, you know ? I felt like it was now or never . . . and then the bank crash happened, which was strange because this was the first time in my life that I’d been hanging out a lot with economists. All around us, people were losing their jobs, their houses, their pensions . . . It was very dramatic. There were all these abandoned buildings at the time because everything had gone bankrupt. And that’s when I had the idea of setting up a kind of music school. It was supposed to have ten rooms, which were to correspond to ten elements of nature. These would then help kids learn music theory and composition . . .
Each room would be like a chapter in an interactive textbook ? I suppose that’s one way to think about it . . . it was really about using one of those abandoned or unfinished buildings. Then the economic situation took a turn for the worse, and everybody who’d lost their savings gathered outside the Icelandic parliament demanding for the government to step down- which they did. People smashed pots and pans until all the ministers resigned. It was like 1968 in Paris. This happened to be at the same time that I realized that I was free from all of my contractual obligations with record companies, which was very exciting. I couldn’t stop thinking about the Internet and the endless possibilities of releasing my own work . . . in whatever form I pleased. And that’s when the apps were developed ? No, first I was contacted by National Geographic, who were starting a record label and wanted me to be their first artist, which I immediately said yes to. At first, I was imagining an unconventional partnership ; I wanted them to help me build the music school ! But they don’t build buildings, so they suggested we do a 3D movie, which I thought was a brilliant idea. I ended up meeting all sorts of directors and film producers, but at some point the project became so huge and expensive that I retreated in a way. I started doing a lot of the work on my own, really DIY. I moved to Puerto Rico for eight months with my sound engineer and that’s when I really started writing the songs for Biophilia. At first, I was using a cheap little organ, as well as some midi stuff I got off of eBay- cheap touchscreens and a couple of Nintendo game controllers. Eventually, sometime in 2010, it became clear the 3D film wasn’t going to get made . . . But you had already done so much work. Yes, loads of it. In two years I finished all ten songs, including the application ideas for all of the natural elements. What are the different elements featured on the album ? Yes- crystals, DNA, dark matter, cosmogony, lightning, and lunar cycles. Creation myths play a key role, too ... What was incredible is that right after I finished all of the songs in spring 2010, the iPad came out. It was perfect timing. So technology caught up with you ! Something like that ... That’s when we started contacting some of my favorite app creators. From what I understand, you sought out a Lot of younger deveLopers and programmers who were working on DIY music programs, is that right ? They were all different ages actually. But I contacted programmers who’d done some of my favorite apps- some musical but most not. I was in regular contact with the app designers, explaining the concepts behind each element and what needed to be included. These were then integrated into the "mother app" on "Cosmogony", where each verse of the song is about a different creation myth : Native American, Sanskrit, Aboriginal, and modern science- which would be the Big Bang theory. After talking to a bunch of scientists I found out that many of them feel the Big Bang, at least as it’s taught in schools, is pretty outdated, very "twentieth century". The designer and developer Scott Snibbe was also involved, right ? He was the project manager. He oversaw the app development. Were you in constant contact with scientists while you were writing the individual songs ? Not exactly. I wrote the songs first and then eventually contacted some of the experts for details. Most of the research came from watching university-level educational DVD’s and reading books on my own. So there was a huge amount of research involved ? Yes, but it was more fun than anything else. I heard you collaborated with Drew Berry for the animation of DNA. He does such incredible visualizations of molecular biology. How was it working with him ? He’s quite an animator. I think our collaboration for the DNA app is the thing that comes closest to a music video. We actually have tentative plans to put together an animated video on brain functions- specifically, what happens in the brain neurologically when people sing. It’s always fascinated me how important science is for art and vice versa. Lots of scientists utilize artistic renderings in order to better understand or visualize certain processes. That’s true. But I would say that this whole project is about taking things that are kind of academic and transforming them into a three-dimensional, non-academic interactive experience. I’m sure the app descriptions sound complex and esoteric, but when you actually see and use these things, it becomes much clearer. When I saw the premier in Manchester, it was the Lightning that really grabbed my attention, but I’ve always been fascinated by Tesla. How did you come up with the idea of writing a song about electrical currents ? It happened during my research . At one point I was youtubing non-stop and eventually stumbled on all these videos of people making music with Tesla coils. That was the beginning. More than anything, it struck me as something a child would enjoy, because it’s so dramatic looking. When we did the weeklong course in Manchester, showing children the instruments and asking them about their favorites , the Tesla coil was always at the very top of their list. It’s because it’s the most visceral and spectacular visualization of the sound, I think. It brings the listener inside the sound by bringing the sound outside in the form of visualization. That reminds me so much of our discussions in Paris from a few years ago-having the listener not be an external entity but rather completely immersed in the music itself ; an active, not a passive, part of the aural experience. I think that’s why this current project had gone through so many different manifestations, from music school to 3D film to what it is today . . . At its core, the project is about inclusion. Some people have the impression that the digital world creates only virtual connections and discourages live experience. But I think that couldn’t be further from the truth, and this project shows just that. Having seen the premier, it was clear that the live component is more important than ever when there is an increased emphasis on the visual. 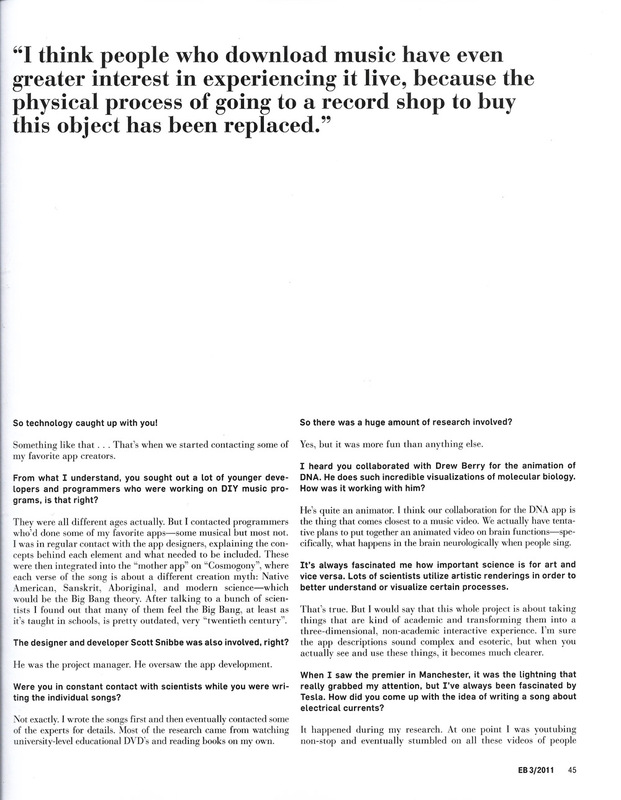 I think people who download music have even greater interest in experiencing it live, because the physical process of going to a record shop to buy a physical object ha been made more or less obsolete. That’s why seeing live music becomes the primary way to experience the music non-virtually. But the very idea of what’s physical needs to be redefined. All the record industry pessimism towards the disappearance of the physical is unwarranted, if you ask me. The meanings are merely shifting. You know, people will always hunger for physical experiences. Future generations will all be born with two arms, two legs and a sense of touch. You mentioned before that you felt inspired when you realized that you were out of your contractual obligations for your record company. What kind of freedoms have the Internet and applications provided you with ? Has it made you more independent ? Creatively, I can do so much more. Instruments in the form of applications are far less expensive and reach exponentially more people than the physical object. With apps, it feels like anything’s possible. I’ve experienced at least three different album formats, and the app and digital download is by far the least dependent on the music industry. It’s reintroduced something very punk back into music. After we finished the entire project we were able to pick and choose who we wanted to offer it to. All of the major labels were scared out of their wits-they didn’t want to touch something so different from a "normal" album. Then we thought about how welcoming Apple had been to us technologically, allowing us to release an app album in their store without "signing" to any label. They haven’t sponsored me and I’m not advertising them-they simply have a set up which can distribute Biophilia ; they combine all of the technology necessary to explore what we had created. Also, in 2010, the iPad was the only proper touchscreen on the market. But I’ve now decided to work with Universal and Nonesuch to distribute the physical CD. In the beginning I thought that no one would be interested in that anymore, but that’s not so. Sound is experienced in so many different ways. That’s why I wanted to make both apps and acoustic instruments. It was important for me to emphasize the use of air, water wind and oxygen to create sound. People shouldn’t perceive this project merely as a virtual phantasy world. They should see it as an exploration of the crossroads of electronic and acoustic sound- but from a different angle. How do you fully realize this in a live context ? Live, the music is played on touchscreens connected to acoustic instruments that read digital information. In order to give people a better idea of how the instruments work, we’d actually like to create some short films for the crowd to watch before the concert. Is it true that David Attenborough did the narration for the introduction to the umbrella app ? Yes. The BBC was doing a documentary on the making of Biophilia, which David will probably be involved in. We asked him at the very last minute about the app and he said yes on the spot. We immediately gave him the introduction and then recorded it the very same day- it was all very spontaneous. He has a very calming presence. Indeed. It always makes me think of the difference between American and British nature documentaries : American nature documentaries are usually much scarier, and the music is much more dramatic- even if the animals are totally harmless and unthreatening. An American documentary on bees would start out with a narrator exclaiming, "If one thousand bees were to sting you at the same time, you’d die ! " Do you think that European nature documentaries are generally more benign ? Less threatening, for sure. And David Attenborough always makes the situation seem hopeful and positive- at least regarding the relationship between humans and nature. How did you come up with the title for the project ? I’d been reading a book by Oliver Sacks called Musicophilia , which is a collection of anecdotes about his experiences as a neurologist with sound and treating patients. I felt really inspired, and I then had the chance to meet him personally. But as a general matter, I’m fascinated by the visualization of sound, and how sound waves travel- even though my visualizations tend towards particle, not wave movement. On a macro level, sound moves like billiard balls ; or even planets and solar systems. Pythagoras saw the cosmos similarly ; he ascribed a note to each planet. 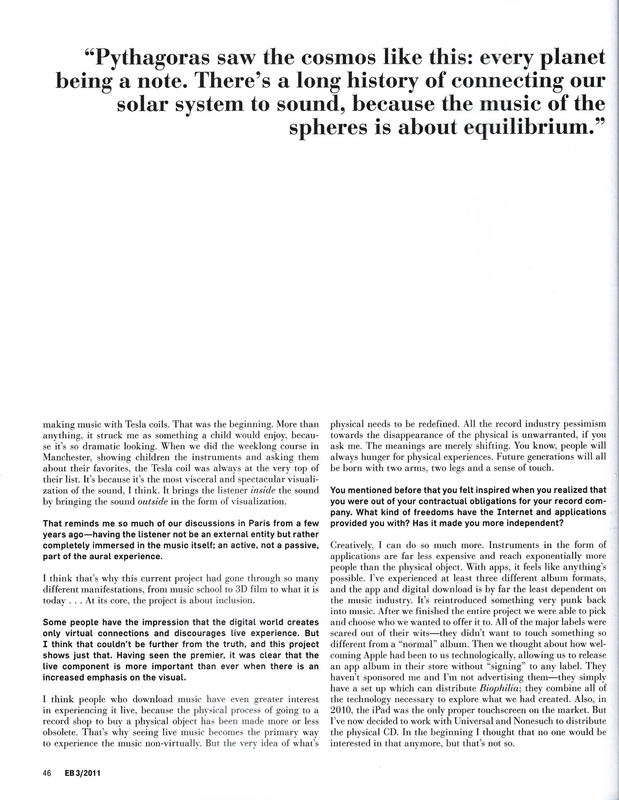 There’s a long history of connecting our solar system to sound, because the music of the spheres is all about equilibrium and vibration. That’s why I wanted the website and Biophilia app to be set up like a galaxy. It’s the easiest way to explain how sound behaves in space.